Ask for help, how to use AHK_H, etc. How to share variables between threads? Hello, I'm asking this because I couldn't make it by myself (already read the docs) and couldn't find any answer on the forum. Last edited by kyuuuri on 13 Jan 2019, 19:28, edited 1 time in total. Re: How to share variables between threads? I can't believe it was that simple, I tried using "GlobalVarsScript" function i found before and i couldn't do anything. Is there a way to do this for a simple variable instead of an object? u can pass the address of a regular var. u can even pass the address of a regular object, it's just that u're probably gonna wanna use a CriticalSection whenever u modify it, or else u might crash, whereas CriticalObject already does that automatically. Nice, thank you. 1 last question in case you can answer (if not I will open another topic). I get "variable name too long". 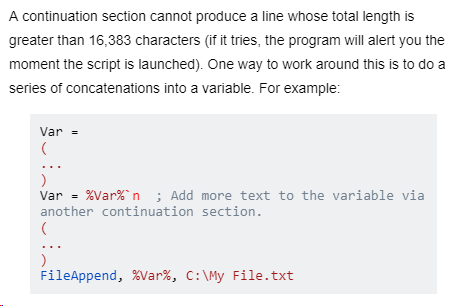 Does this mean that the content (not the name) of the variable is too long? or is this a bug? Is there a way to have that 562 lines code inside this script to be launched on another thread? msgbox Process %process1% not found. msgbox Process `%process1`% not found. But also, replacing every "%" with "`%" is not the answer because it breaks the script. So what rule should I follow when replacing "%" with "`%". And when i do CritObj.on = 1 on a thread it shows an error: "CritObj.on Does not contaign a recognized action", but if I do CritObj.answer = 1 it works. There you go. I already read CriticalObject and AhKThread docs as well but I can't find anything about this. =, oh ure assigning, i assumed u were comparing.. I feel stupid, but that was an small detail hahaha. Thank you!